In our previous tutorial, we explained how to manage a Windows Server 2012 remote GUI server from a Windows Server 2012 server. 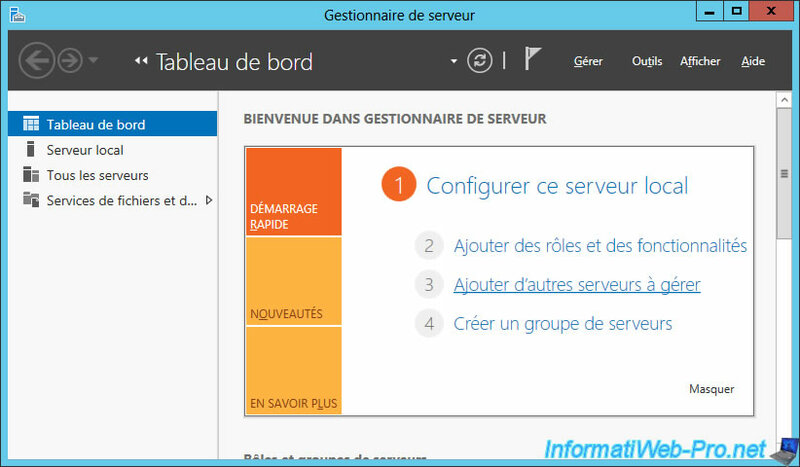 For those who don't know, it's also possible to install Windows Server 2012 without GUI (in Core mode). 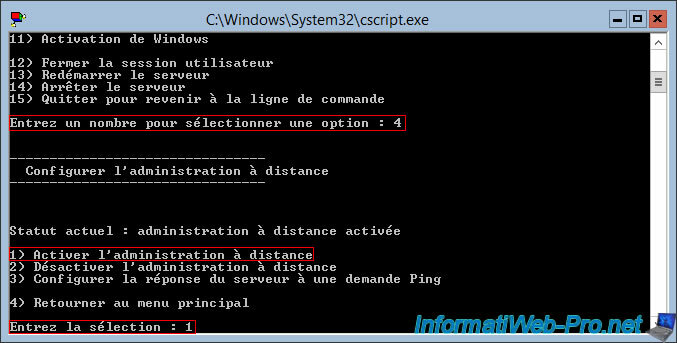 In this case, you will have to configure the remote server with the command line and not with the usual consoles. This tutorial is therefore an adaptation of the first tutorial, but using only the tools available in the Core version of Windows Server 2012. Note that to make it easier to manage your server remotely, it's recommended that you join your servers to your Active Directory domain. This is what we will do in this tutorial. Note : an upcoming tutorial will be published soon for the remote management of a server present in a workgroup (not linked to an Active Directory). To enable remote management of your Core server, launch the "sconfig" tool from the command prompt on the screen. Now, your Core server is manageable remotely. Or at least, a minimum. Log in with a domain account on a server of your network linked to the Active Directory and open the server manager. Then, click : Add other servers to manage. In the "Active Directory" tab, you will see your domain as a location. In the "All Servers" section of the Server Manager, you will find your local server and your Core server. Although Windows Server 2012 can connect to your remote server remotely (with WinRM enabled in the background), you will still not be able to access all the features available in the Server Manager. 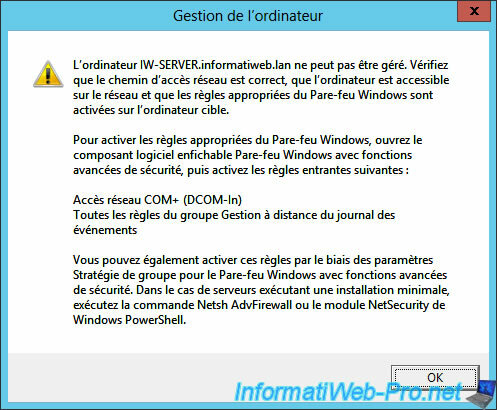 Although the "COM+ Network Access (DCOM-In)" rule is present on GUI installations, you will see that this is NOT the case for Core versions of Windows Server 2012. On your Core server, use these commands to export the firewall rule list to a text file. Note: the "CHCP 1252" and "CHCP 850" commands respectively allow you to export the result in the encoding used by default by the Windows notepad, then to reset the normal encoding (OEM 850) used by default by the Windows command prompt. As you can see, the contents of the file is displayed correctly and the accents are well recognized by the notepad. If you are looking for the "COM+ Network Access (DCOM-In)" rule in this file, you will not find it. 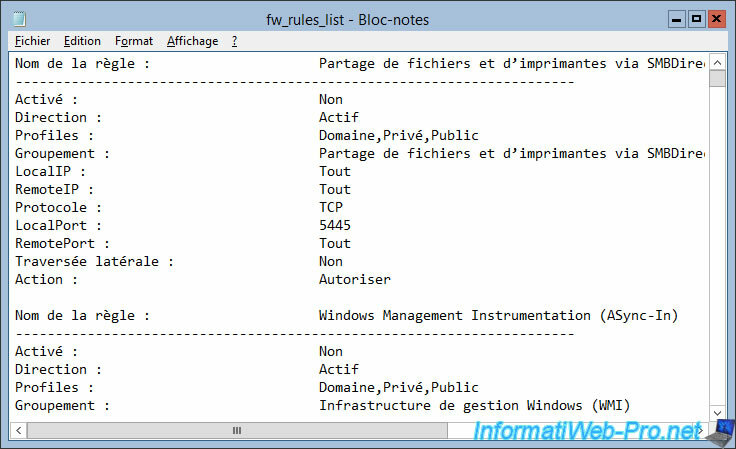 After several searches on the Internet, we found that it was necessary to activate the rules of the "Windows Management Infrastructure (WMI)" group for the Core version of Windows Server 2012. Now, you will have access to the "Computer Management" console for your Core server. At the moment, you will be able to access almost all the features of this console. Note that access to the Device Manager will not work because, as noted on the Microsoft site, it's no longer accessible remotely from Windows Server 2008 R2. Disk Management will not work at this time, because it requires additional server-side and client-side configuration.